NYC, 04/30/2019, 7:00PM. 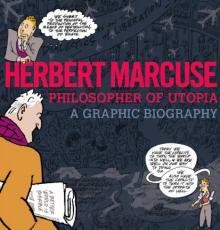 Herbert Marcuse, Philosopher of Utopia: A Graphic Biography. Marcuse (1898-1979) was a little-known German scholar when he became one of the 20th century’s most unlikely pop stars: a celebrity philosopher. In the 1960s, his argument for a principled utopianism catalyzed the ideals of a rebellious generation. Nick Thorkelson is a cartoonist living in Boston. He has done cartoons on local politics for The Boston Globe and in support of organizations working on economic justice, peace, and public health. He is the co-author and/ or illustrator of The Earth Belongs to the People, The Underhanded History of the USA, The Legal Rights of Union Stewards, The Comic Strip of Neoliberalism, and Economic Meltdown Funnies, and has contributed to a number of nonfiction comics anthologies.